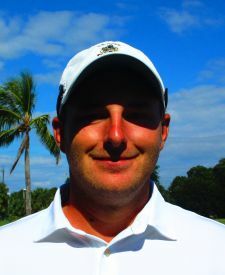 PALM CITY, Fla. – Davey Jude of Jupiter, Fla., was the only player to break par Wednesday as he earned his first victory on the Minor League Golf Tour. Jude posted a one under par 70 with three birdies and two bogeys at Martin Downs Country Club. Originally from Kermit, WV, Jude turned pro a year ago, soon after winning the 86th Dixie Amateur at Heron Bay in Coral Springs. He raised his career MLGT earnings to $10,770 when he collected $902 Wednesday. He got $670 from the $3,165 purse and $232 from an optional bonus pool. Brett Melton, a club professional from Washington, Ind., was second among 25 starters with 71 on five birdies, three bogeys and a double bogey, collecting $720. The combination of off and on rain, 20-25 mph winds with gusts of 35 mph and temperatures in the high 40's made for very tough scoring conditions during the first MLGT event of 2018. The first tournament of the MLGT’s 15th season drew 25 starters. The Tour plays again Thursday at Jupiter Country Club.